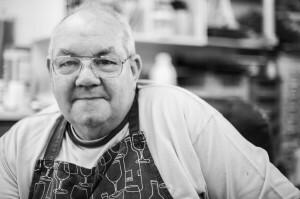 If you were to meet John Turner, you would never guess what he creates, but when you see it you find it hard to believe. He’s been a butcher, he’s been a joiner and he’s even driven trucks amongst other things. All are perfectly believable and unsurprising, but when you find out he makes flowers and fruits out of sugar paste for cake decoration, for a moment you are taken back. His hands don’t look built for the delicate work involved in sugarcraft, but somehow he is able to produce the finest of work with this fragile material. 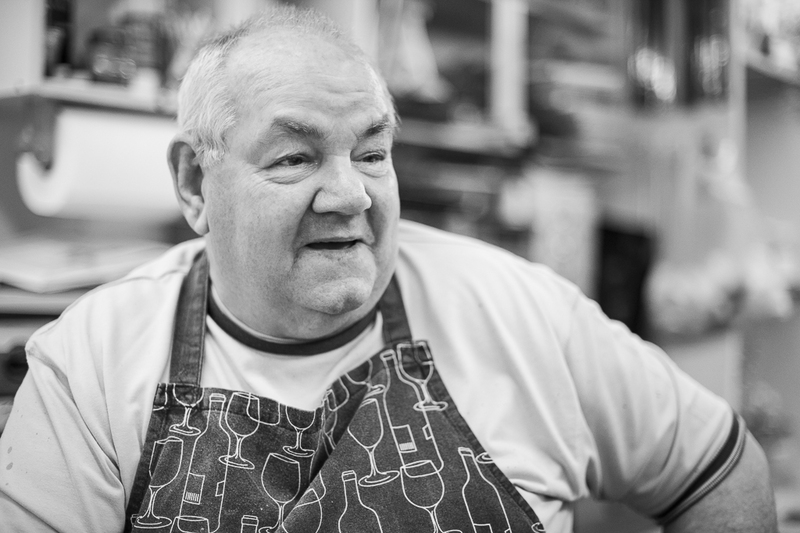 The thing that fascinates me about John is his complete obsession with the finest of detail, and it is this obsession that, for me, places him firmly in the Artisan bracket. 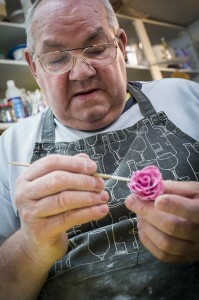 John first started creating flowers from sugar paste following a bet. yes, a bet. Nothing involving money of course. 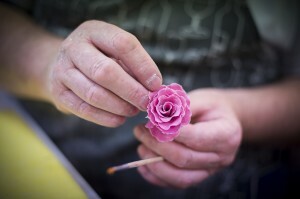 He was watching a TV show with his wife Carol, watching somebody making flowers to decorate a cake. It was Carol that then uttered those fatal words to creative person – “I bet you can’t do that.” That, as they say, was that …. he had to prove her wrong. John takes the attitude that there is nothing that can’t be recreated in sugar paste. If he is asked to make something that he has not made before he takes on an almost anatomical approach. He will find the desired flower or plant, either from the wild or he will purchase one from a shop, and then will systematically dismantle it piece by piece to understand all the individual parts, how they all go together and start to work out methods of recreating what he is looking at – a kind of reverse engineering. If we take a simple flower bud for example, John doesn’t simply reproduce the likeness of a flower bud. He builds a flower bud from the “ground up”, building up stamens, all the petals folded tight inside the bud, never seen, but as John says … “because I know they are there”. As he has “unpicked” many buds he knows that how the very shape of the bud is determined by these internal, unseen structures. I find this attention to detail amazing. John also researches every plant he creates, studying the lifecycles and any variations and idiosyncrasys there may be with that particular plant. For example on a oak branch of acorns there may be acorns that don’t form correctly, we all know that acorns drop and leave an empty “cup”, he knows that some blackberries dont grow fully, or develop at all – all this John will have researched and included in his work. 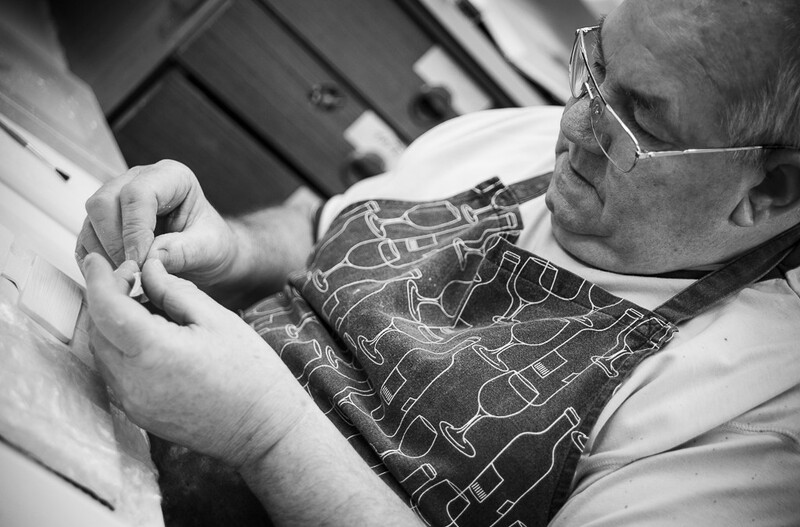 It started as a fascination of mine, as a creative, in the passion and attention to detail and accuracy of a true Artisan. It’s more now, John and I are good friends, and it is a real pleasure to know him, to watch him work and to share some of his fantastic creations.